Despite both of her attackers being apprehended, neither was charged with a crime, and Yamaguchi herself would later tearfully apologize for “causing a commotion.” AKS, the company that manages NGT48, maintains that no employees or performers did anything illegal, either in mishandling Yamaguchi’s personal information in a way that allowed the attack to take place or in the company’s response following the incident. Nevertheless, AKS temporarily suspended NGT48’s performances, only announcing last Sunday that its regularly scheduled concerts at NGT48’s regular venue in a Niigata City shopping center will resume as of Feb 9. 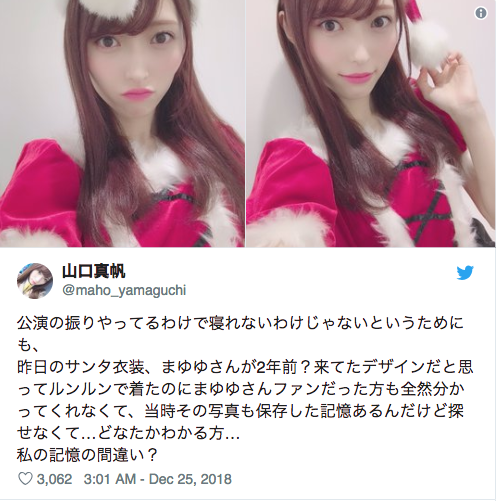 Meanwhile, Yamaguchi has remained extremely quiet on social media, sending out no tweets of her own since January 9, and only retweeting twice, both times in relation to AKS replacing NGT48’s manager once the attack became public knowledge. However, while Yamaguchi herself hasn’t said anything new, there’s something significant that she’s not saying, as her Twitter profile no longer claims any affiliation with NGT48. Yamaguchi’s Twitter profile, which previously included a mention of her membership in NGT48, is now completely blank, with nothing but a link to her Instagram account (which also contains no mention of NGT48 membership in her profile), her Twitter join date, and her birthday. NGT48’s official website does still list Yamaguchi as a member of the group, and even mentions her status as the sub-captain of its Team G division. However, Yamaguchi is absent from the list of performers for NGT48’s concerts on Feb 9, 10, and 11, each of which feature between six and 16 of the group’s roster of 42 idols in total. 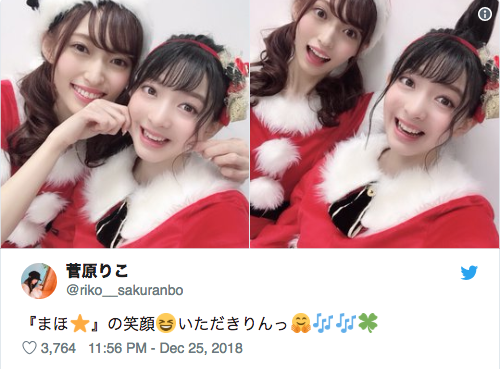 In addition to Yamaguchi, three other NGT48 idols have also removed mention of their membership in the group from their Twitter profiles: Riko Sakuranbo, Fuka Murakomu, and Rena Hasegawa. All three are members of the same Team G division as Yamaguchi, and Sakuranbo (pictured with Yamaguchi above) and Hasegawa were the last two NGT48 members whose tweets Yamaguchi retweeted(although Aina Kusakabe, the third-most-recent NGT48 idol Yamaguchi retweeted, still has her NGT48 status mentioned in her profile). Like Yamaguchi, Sakuranbo, Murakomu, and Hasegawa are not scheduled to appear in any of NGT48’s currently listed upcoming performances. In addition, none have tweeted since Jan 8, the day before Yamaguchi went public with the news of her attack, and while they all also remain listed on NGT48’s official website, their Twitter profile updates suggest they may be reconsidering their affiliation following Yamaguchi’s ordeal. Yamaguchi Maho, just another Japanese assault victim silenced by her employer. A sad tale this one. Attacked by unknown men, forced entry to house and NO charges laid by police. "Oh it's all been a big misunderstanding - and management has come to an agreement anyway, so case closed". And the if the indignity of the attack and complicity of police & management wasn't enough, the public apologizing for causing trouble is beyond sad. I hope that the reason the affiliation is gone is because she decided to remove it, not because she was - and the others - were fired or 'disciplined'. I also hope that these young women see they have an opportunity to make a statement about the status of women in this country. But I fear it is just management action and the girls will either slip from public view or in a year things will just be back to normal and no one will remember. She's also recently been liking some tweets by fans who were throwing shade at management and their dodgy practices. Her agent is most likely connected to the yakuza, a lot of talento agencies are. She should just quit the band and go solo, more lions share of the profits too. Kenji - thanks for the link. I remember when that came out years ago and it won some international awards and much acclaim. Was it Big in Japan? Did it resonate with the audiences here? I kinda forgot about it for 20(?) years. It seems to have encapsulated this topic of idol stalking / infatuation to a tee. I will try to catch it online. Yewh it was big, though not many people know or forgetten about Satoshi Kon who was a genius anime director/writer. He was heavily influenced by Alfred Hitchcock, Stanley Kubrick to name a few. This is ridiculous. Let me get this story straight. She was assaulted outside of her own home. The company did nothing afterwards to protect her or make certain she was okay. The company decided not to press charges against the men that assaulted her. She had to apologize for causing commotion because she was genuinely afraid. Now she is being released from the group over the company failing to protect her? will people really continue to support that treats it’s employees this horribly? Nothing about this is right. Another woman is attacked/harassed and some see fit to dismiss the incident as a snore-fest. I like how the Western sources are all glossing over the fact that this is more about enforcement of the love ban than about the assault, despite Yamaguchi herself emphasizing this in every communication thus far. Including her top liked tweet (the one she keeps reliking to bump it to the top) demanding any member who had been involved with fans be fired. Also, they didn't cease performances, they just stopped the main team performances and replaced them with research student performances. They still haven't resumed either NIII or G performances, the new 6-person stage only features former research students who were just promoted last year. Hopefully she will share her experiences about the horrors of the idol world, god knows that industry needs an investigation. JJ JetplaneFeb. 7 03:13 pm JSTThis is ridiculous. Let me get this story straight. > Now she is being released from the group over the company failing to protect her? It's the rotten old victim-blaming game. She was pressured and bullied into doing this - that ain't right!